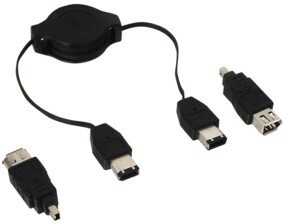 This retractable cable kit is usually used for notebooks and other mobile computer accessories. The big advantage of this retractable cables kit is, you can roll it to a small package.No more lose or twisted in each other cables in the bag, and always the rhight cable with you. The retractable cable is retractable to a maximum distance of 1.2 meters. So retract only the distance you need, no more unnecessary long cables on the table.